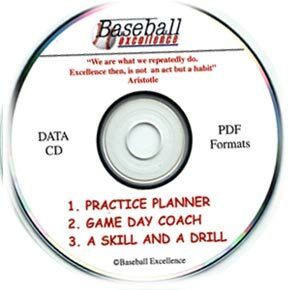 Baseball-Excellence presents A Skill and a Drill, Game Day Coach and Practice Planner all on one data CD! In PDF format, this CD contains the same information that is in the email files. A Skill and a Drill, Game Day Coach and Practice Planner all on one data CD! In PDF format, this CD contains the same information that is in the email files. Get a CD for your coaches. Get a copy as a backup for safe keeping. This is a valuable resource for any coach.